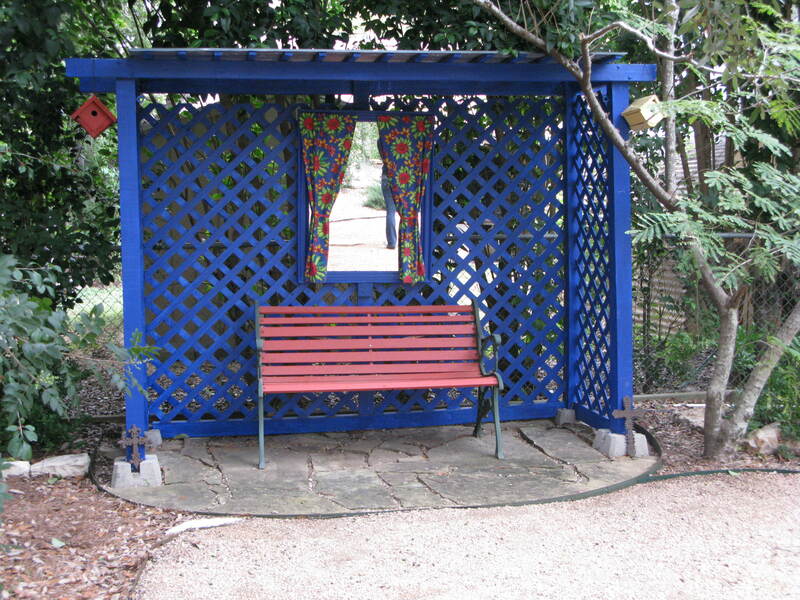 This Saturday is my favorite of the Austin garden tours. 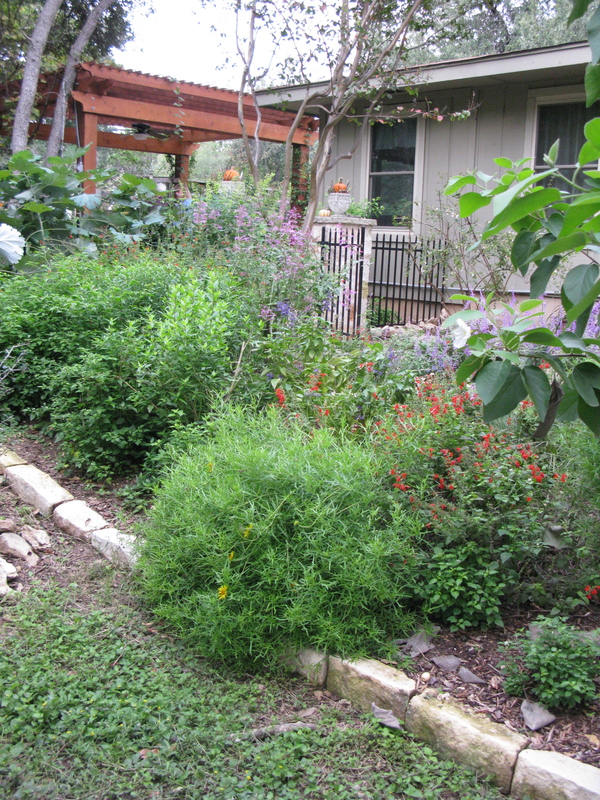 This one is put on by the Travis County Master Gardeners and several of the gardens belong to master gardeners themselves. 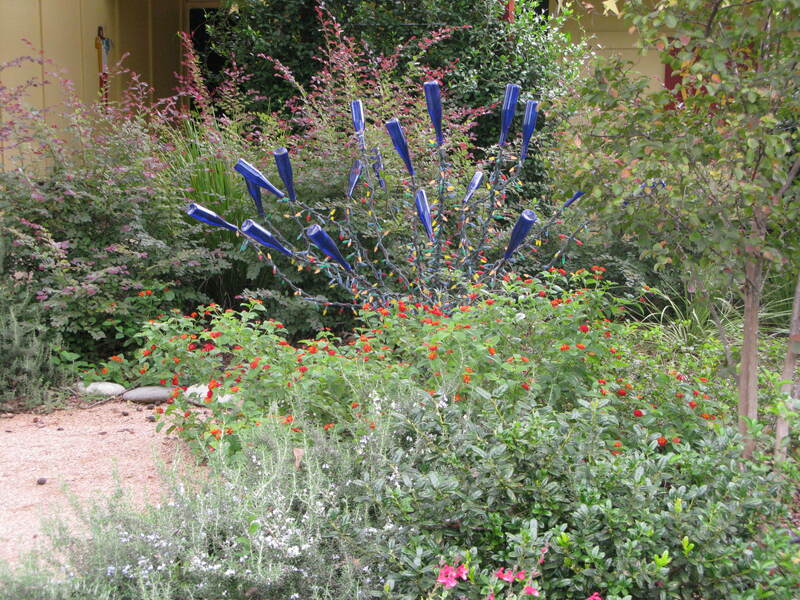 Unlike some of the other tours, these gardens feel attainable. They are still beautiful, but don’t feel out of reach for the rest of us. 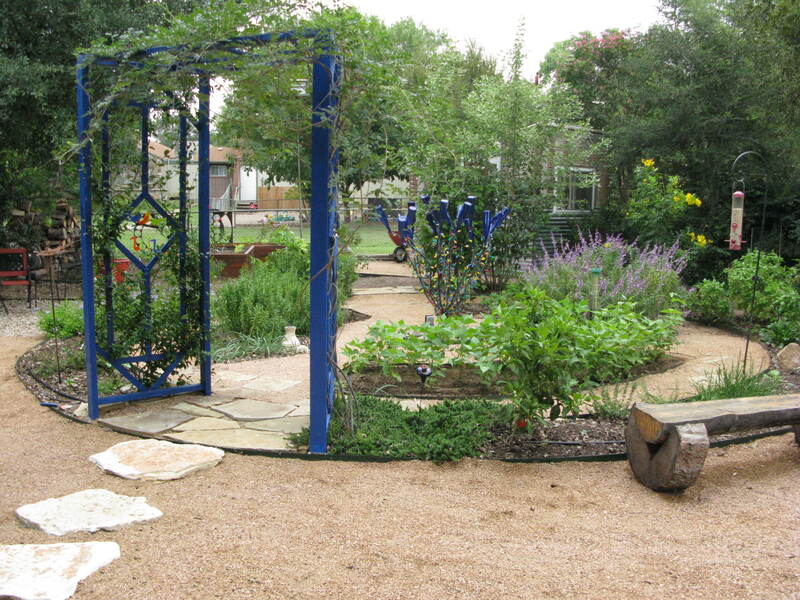 There are also master gardeners at each stop offering information, advice, and usually a few plants to purchase. I had the opportunity to tour 4 of the gardens last week. 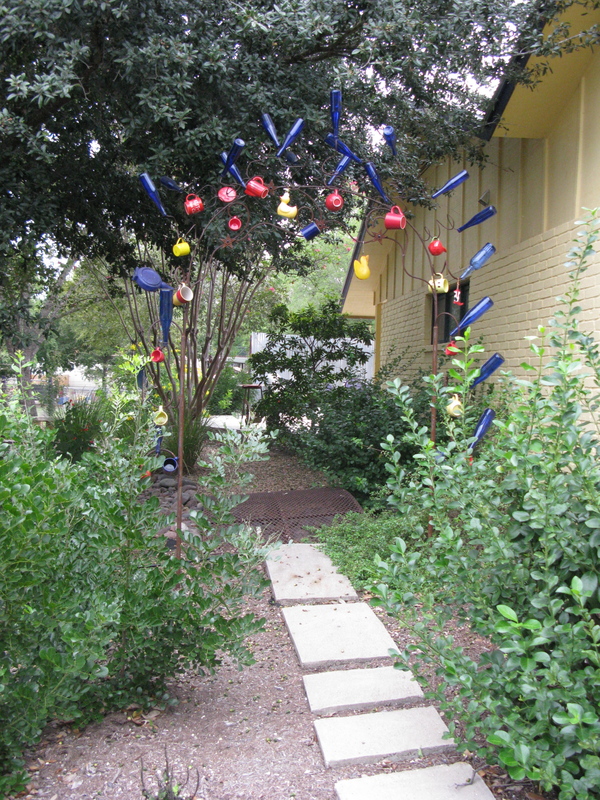 The common themes I found throughout were vegetables integrated with the gardens (hence the name), bottle trees galore, mirrors, fun yard art, and various seating areas to enjoy the gardens from every angle. 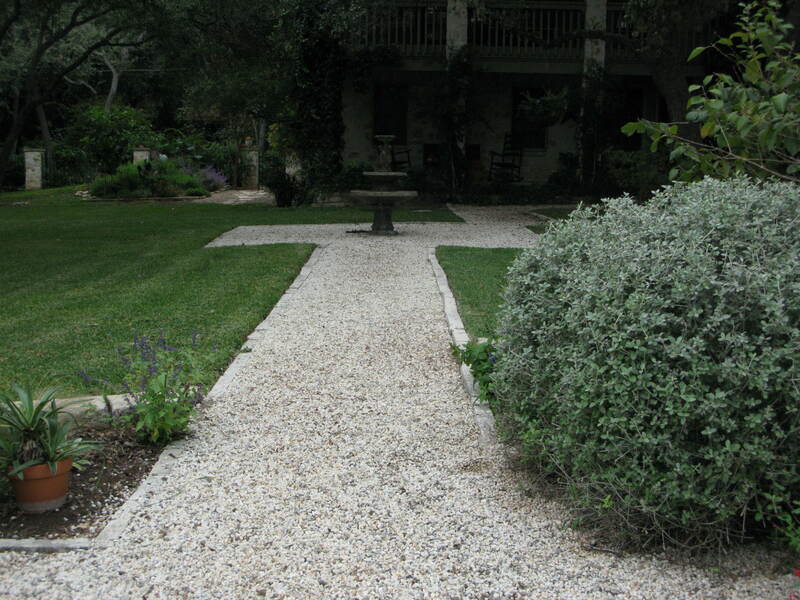 The modern fountain and clean lines of the front yard are very deceptive. The average passerby would have no idea what awaits in the back garden. Carolyn told us that the entry to the garden is known as an Insectary. 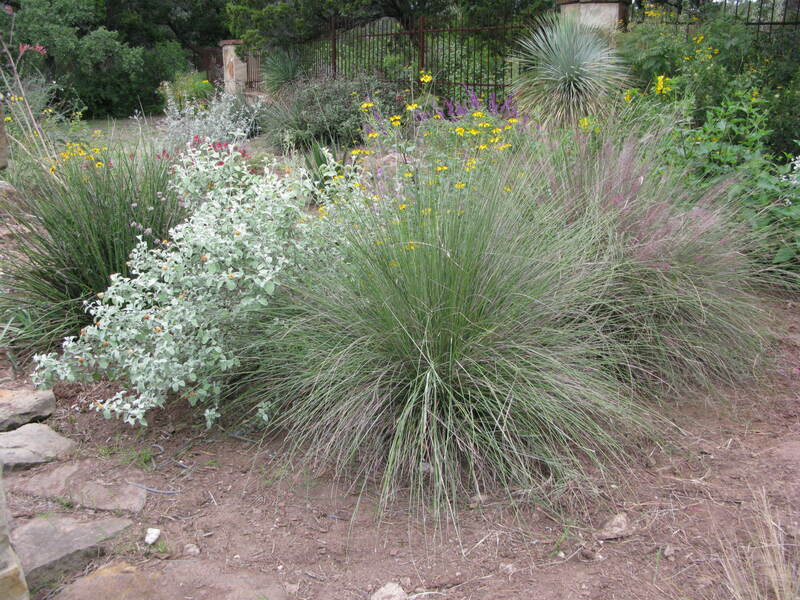 This is meant to attract beneficial plants to the garden. It works on people too! I loved this herb wheel. 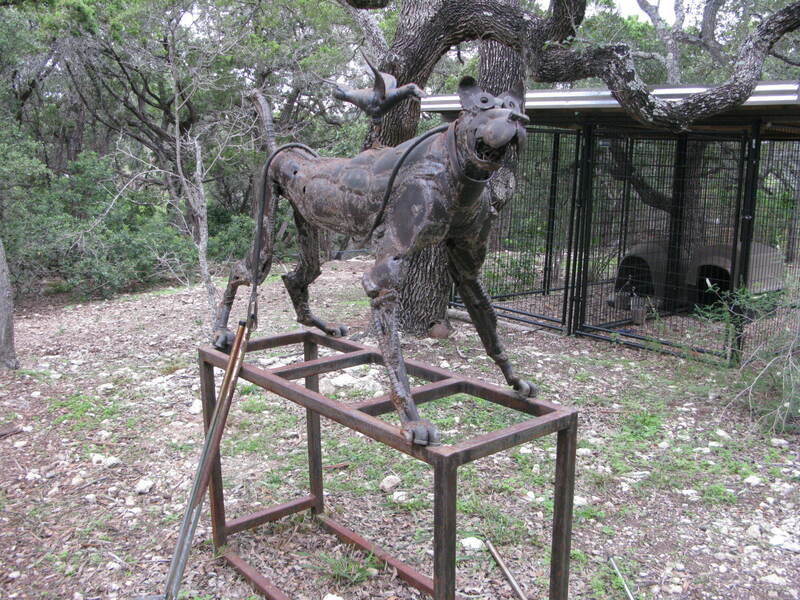 I want to create one of these in my garden. 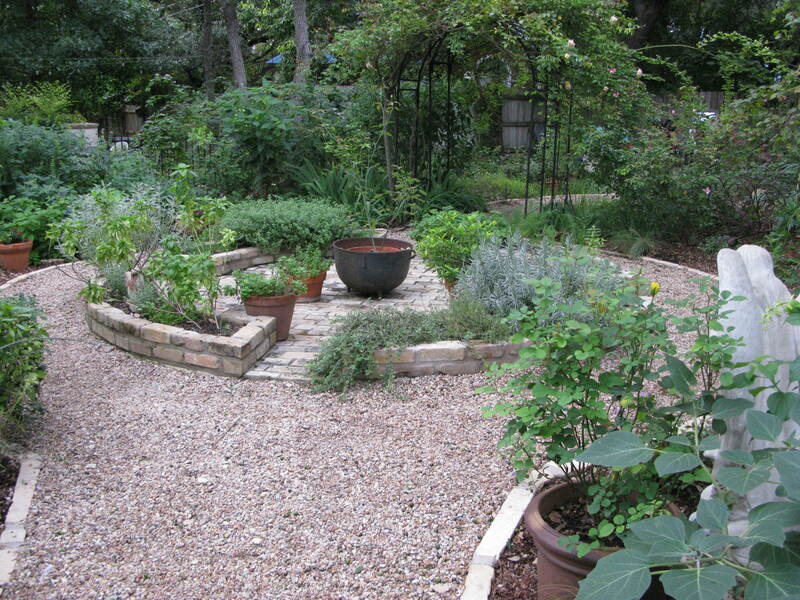 With herbs, for the most part, being deer resistant this could go anywhere. There were a few vegetables here and there, but the majority were in these beds up next to the pool. It seemed to be the sunniest spot in the garden. This took 3 years to build, by Michael, on the weekends. It is really awesome. 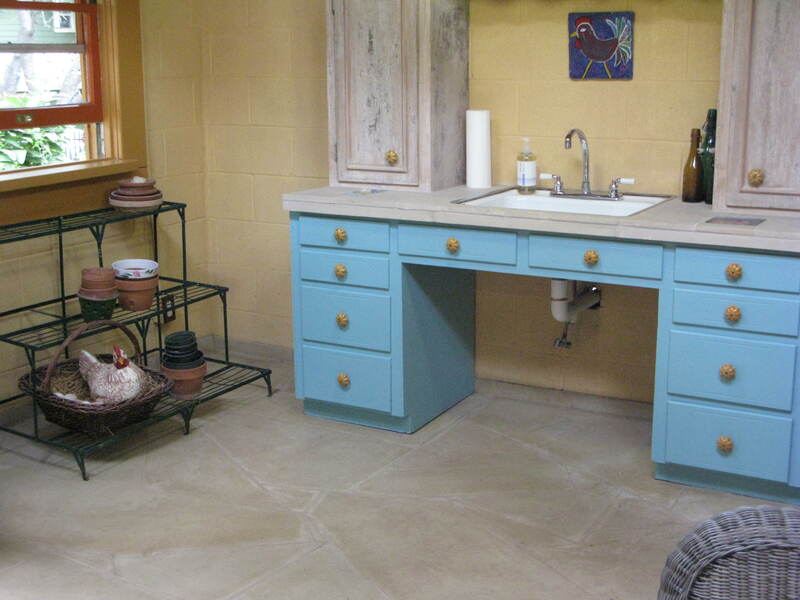 Sink inside the Potting Shed. Seems too pretty to use. 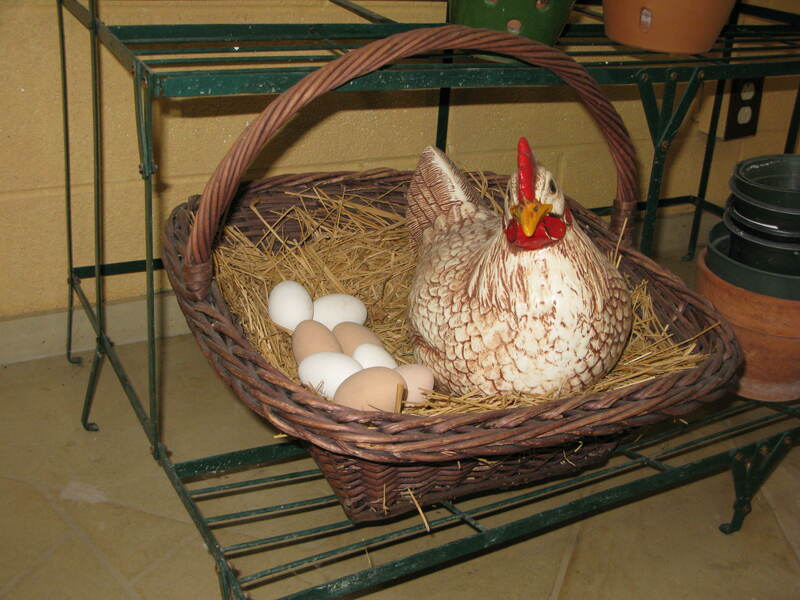 I loved this little chicken and eggs nestled in the corner. 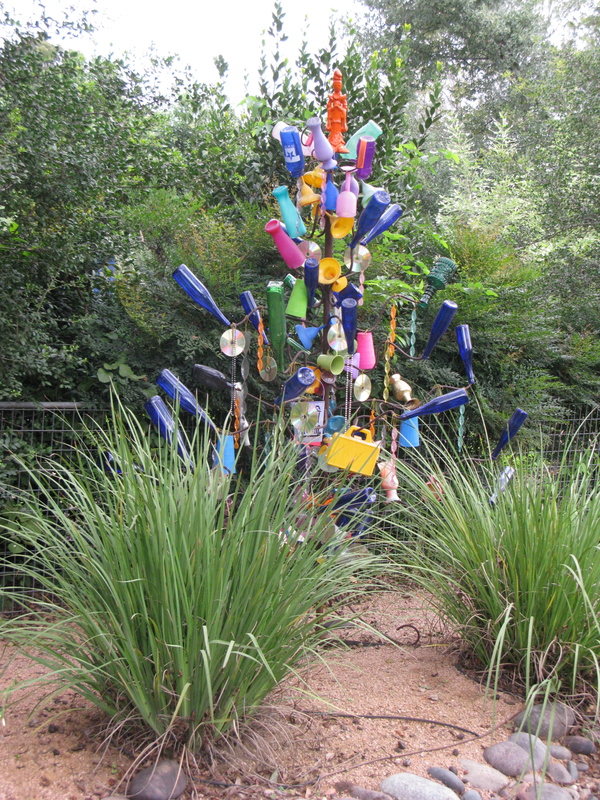 The first bottle tree on the tour was more of a bottle shrub. What a great idea to tuck a mirror in behind it. 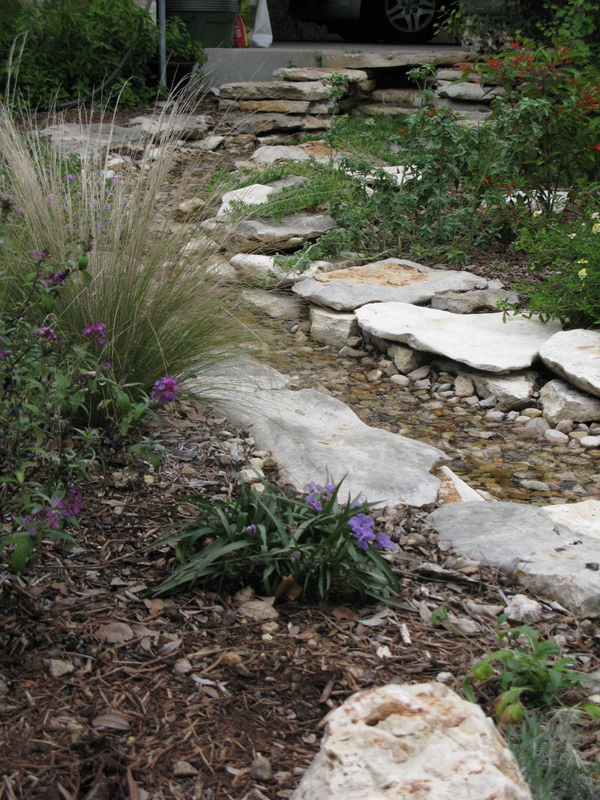 This garden greets you with some beautiful native landscape. I drive by this garden regularly (every time I go to the Natural Gardener) and always drive by slowly and admire the plants. 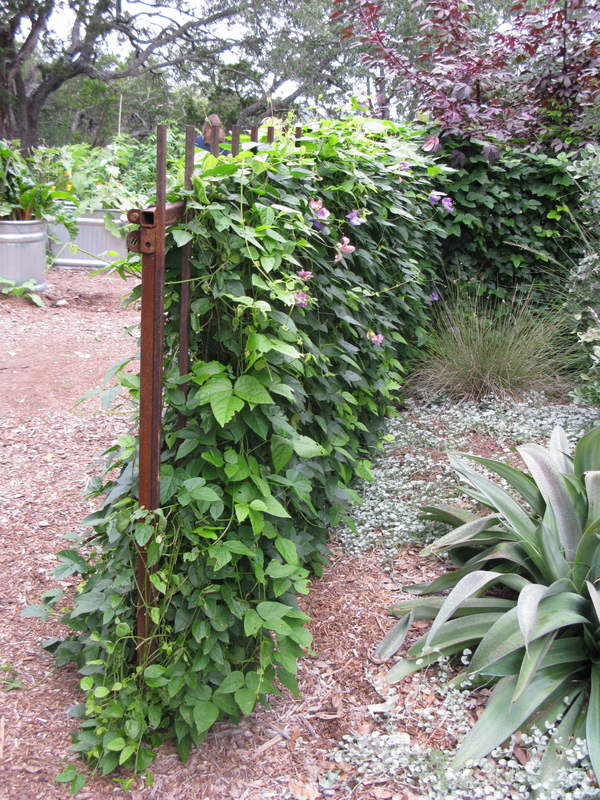 This vine-covered fence welcomes you to the vegetable garden area, much more inviting than plain old wrought iron. Being from Phoenix, I love the desert look. 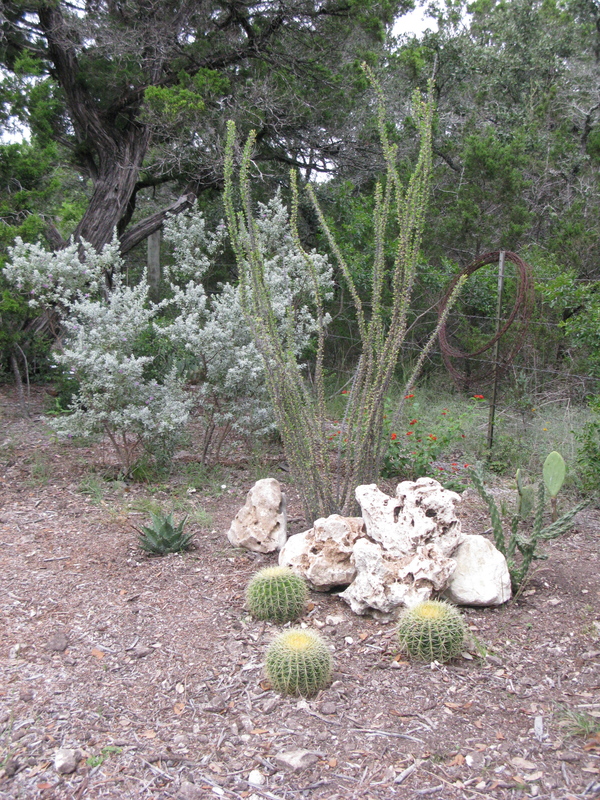 This ocotillo and barrel cactus combo is lovely. The owner clearly likes dogs. 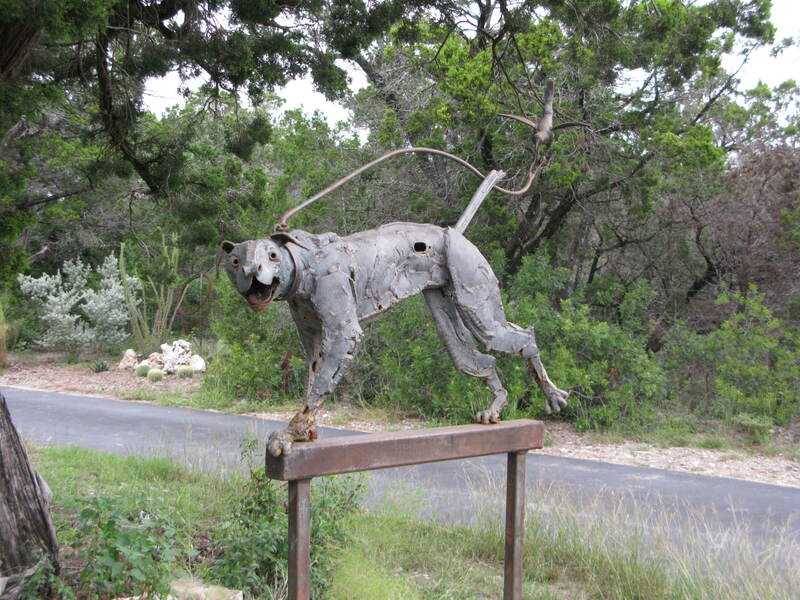 I didn’t get the story behind these interesting sculptures, maybe I can find out on the tour? 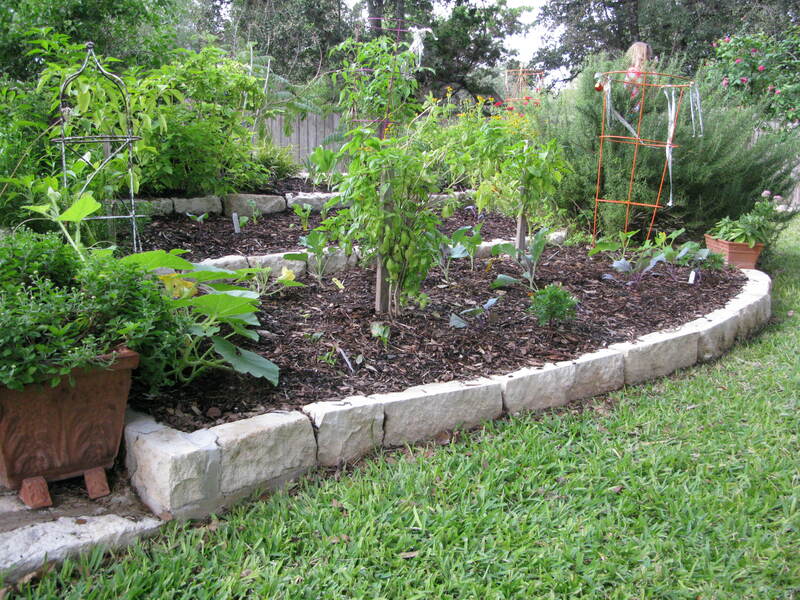 Jennifer chose raised beds for her vegetables. These troughs gave a great modern look, that matched the house. 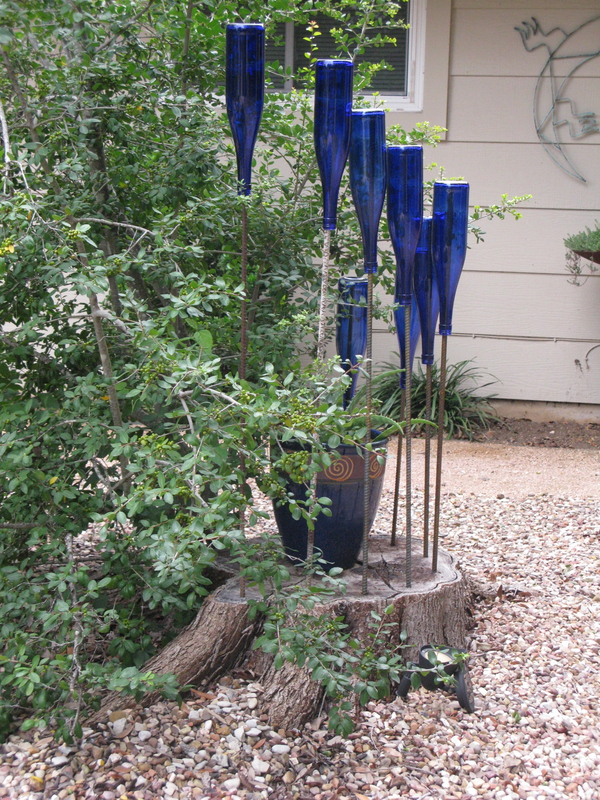 This bottle tree was made by putting large nails into a dead tree. It gives a great natural look. 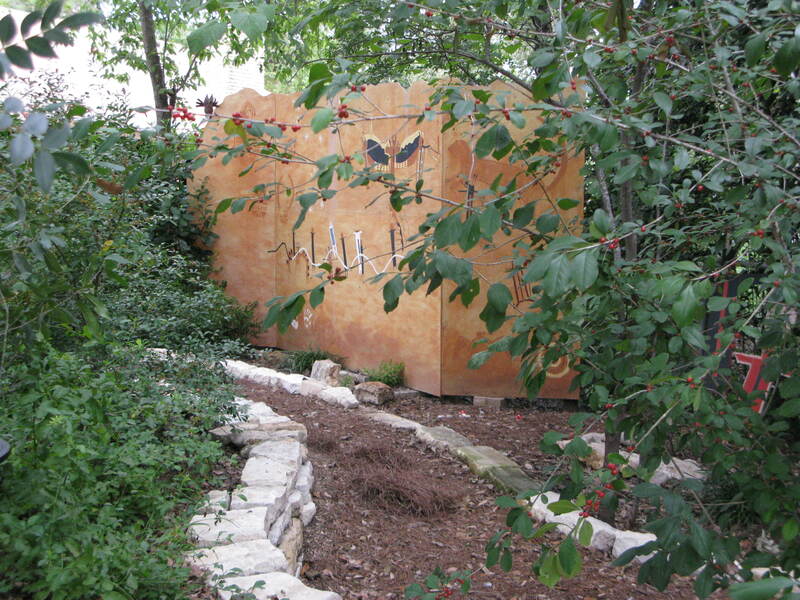 This was really well done, especially all of the native landscaping surrounding it. I loved this greeting to the next garden. 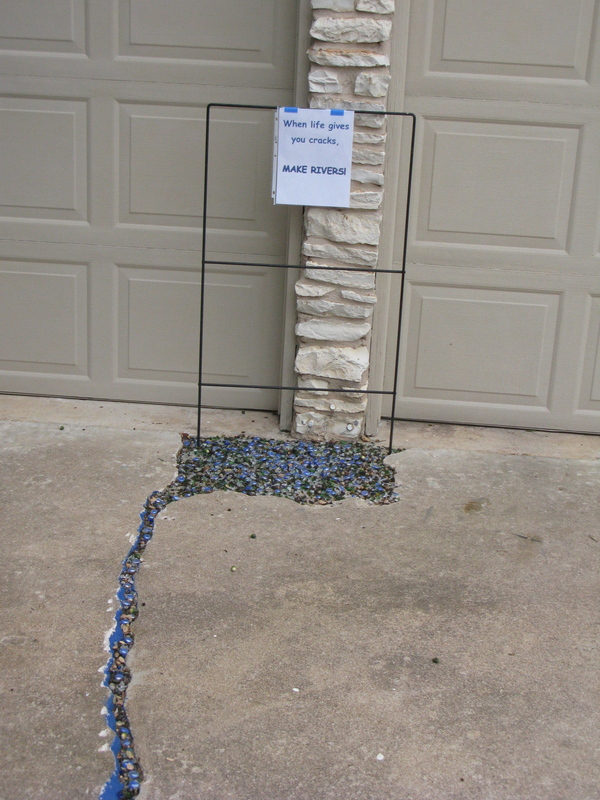 Now we all know what to do with those unsightly cracks in our driveways. You’d never know this water collection tank was here. 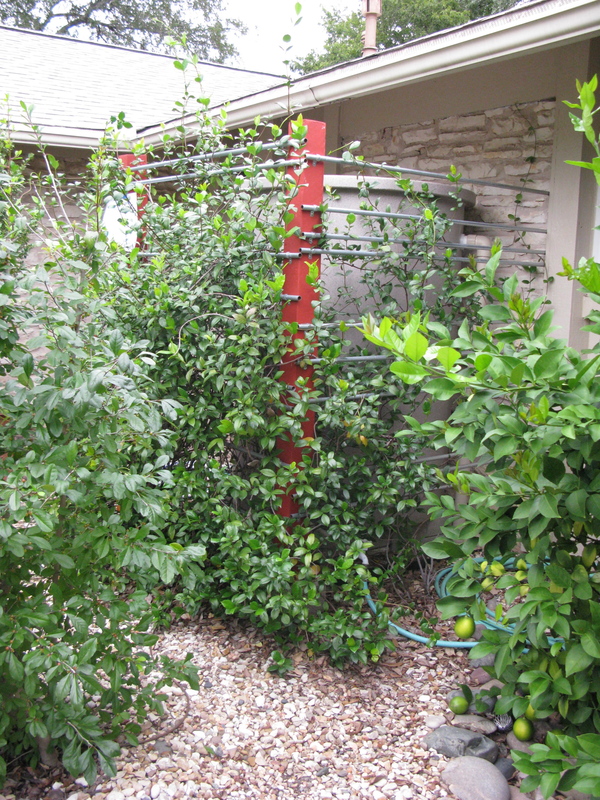 Not only did they cover it with a great arbor and plants, but instead of the usual downspout, they just drilled holes in the gutter. Ann and Robin are big fans of hieroglyphics. 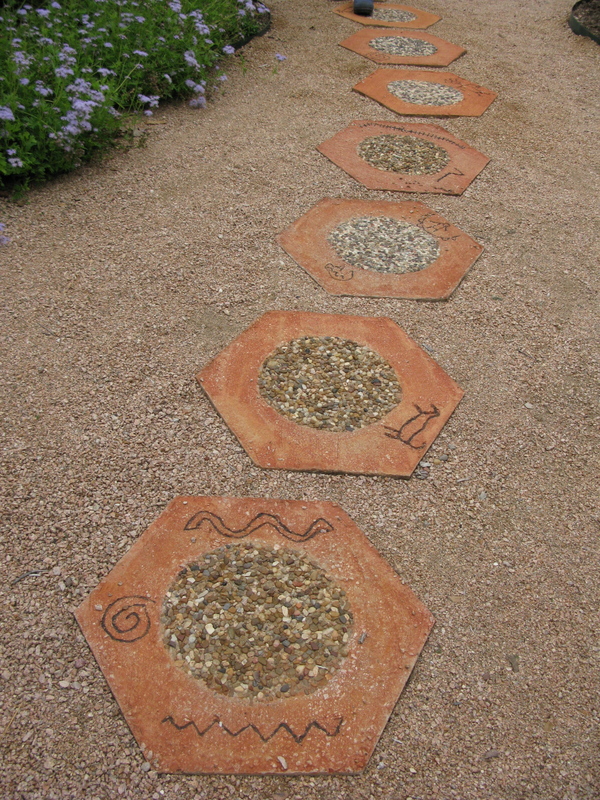 They created these cool path stones to welcome you to the front door. This is where the garden started 12 years ago. It was a small circle at first and grew from there. 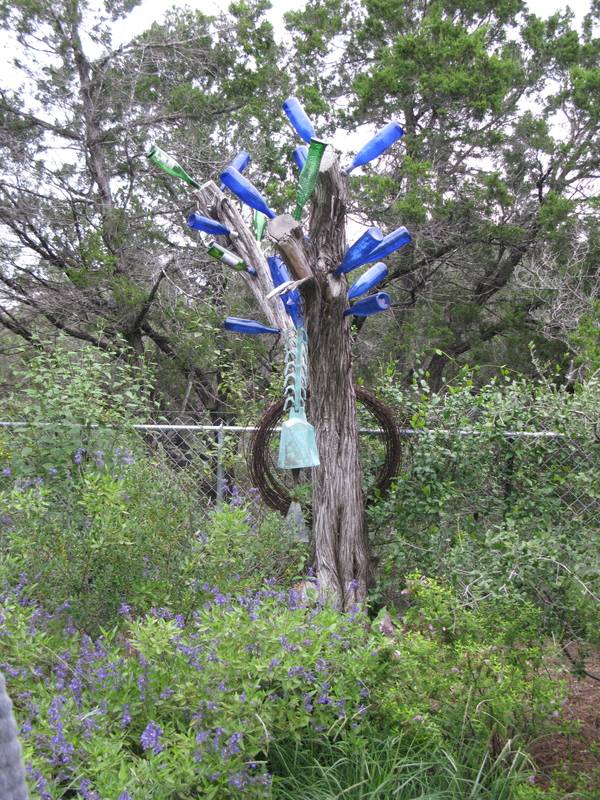 It also houses another bottle tree. They put christmas lights on this one so you can enjoy it day and night. Another mirror. This one fooled several of us as we walked in. It really does look like an extension of the garden. 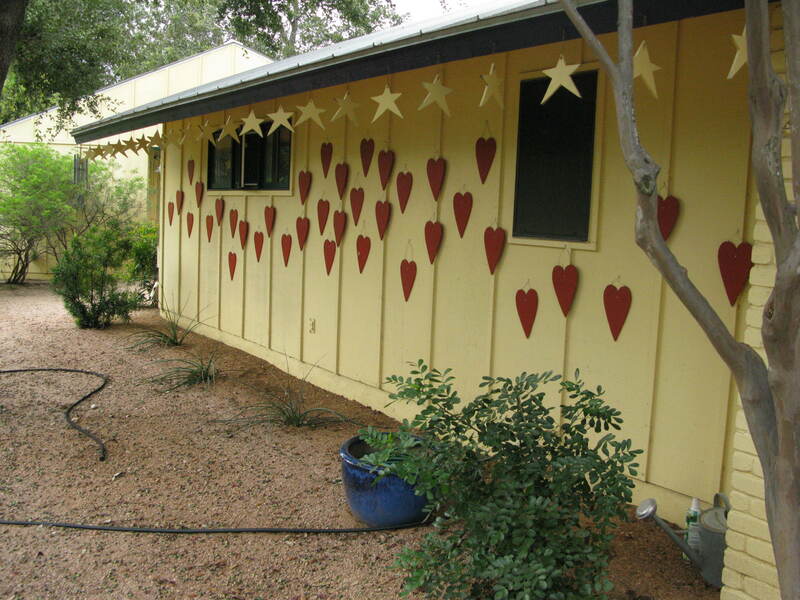 This makes a great divider from the neighbor’s yard, and displays their love again. Ask Robin, he’ll be glad to tell you all about it. 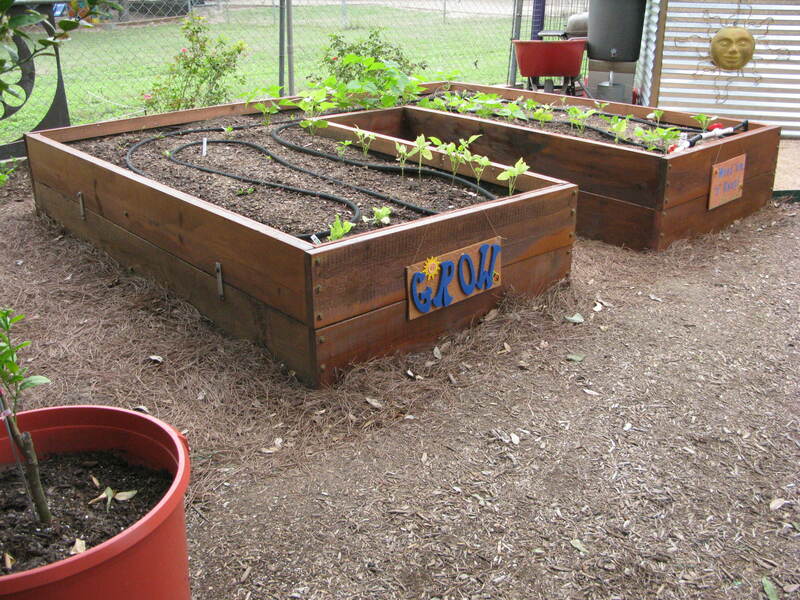 They opted for the raised beds as well. 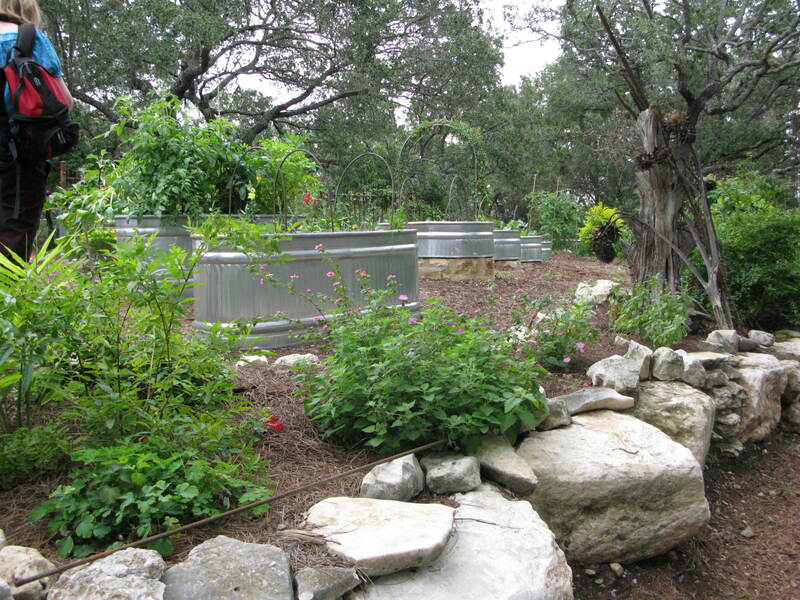 This garden had the vegetables completely separated from the other landscape. 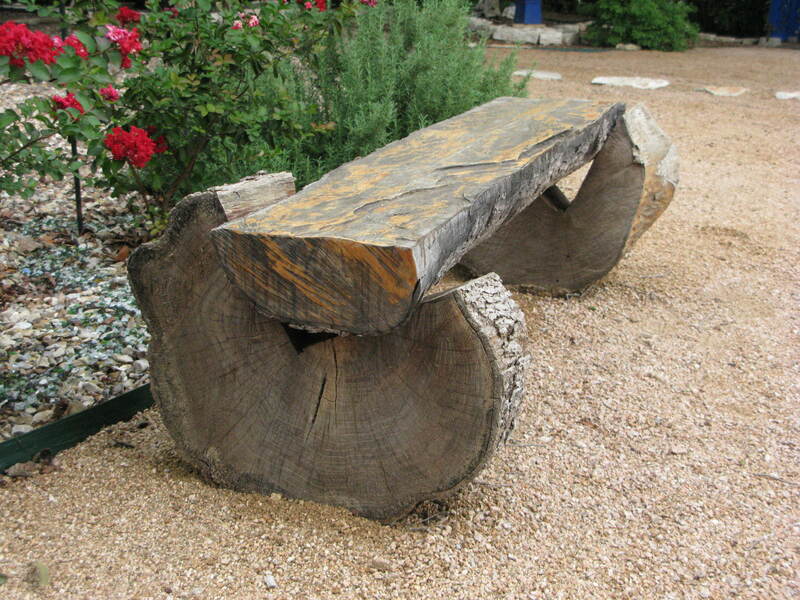 What to do with that old stump? 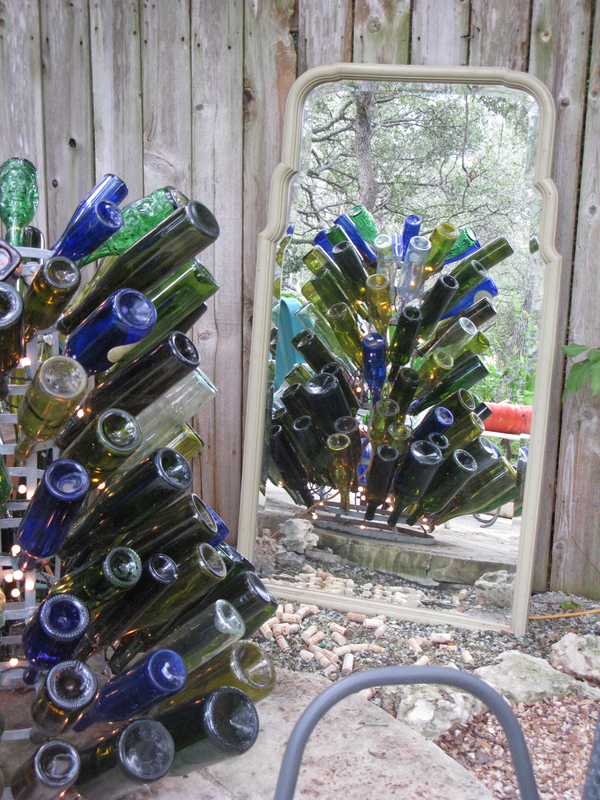 How about a bottle tree? Donnis lives right next to Ann and Robin, so you get a two for one. These neighbors have been friends for years and acknowledged how lucky they are to have each other. This bottle arch is different than any I’ve seen. It also showcased what to do with all those extra coffee mugs. Like the garden, this tree is full of color. I never would have thought to do something like this, but it makes a great backdrop for the garden. This one sits in the front of the house. I really enjoyed all of the houses on the tour and will be going for round 2 this Saturday. It will be interesting to see how many things I missed the first time around. 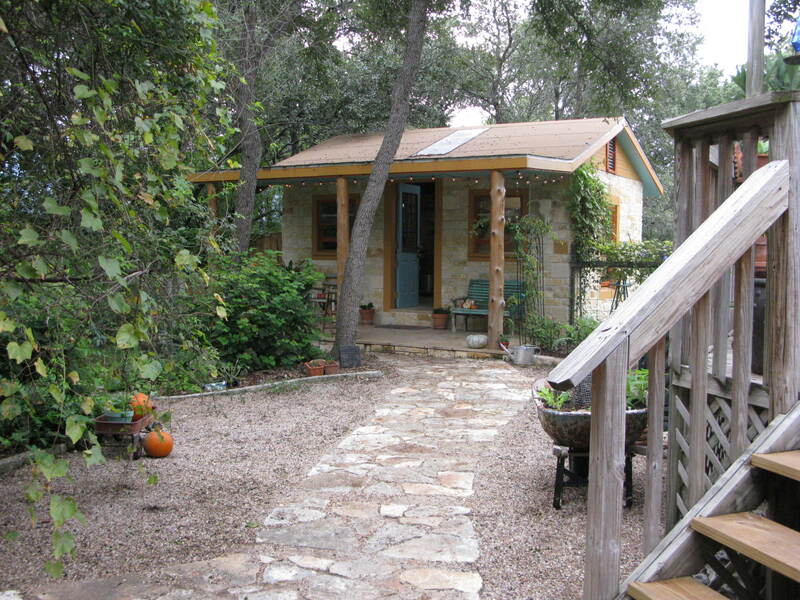 Love that little shed and the painted back of the house. I’m not sure I could do that, but it’s really charming. And that bottle stump is really clever!